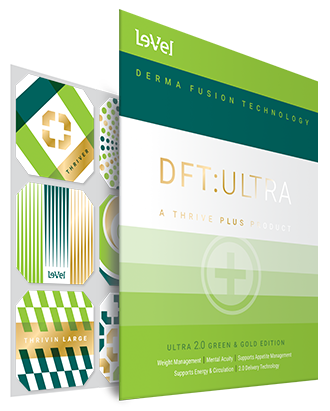 Formulated and developed using the foundation of the most dynamic and revolutionary health and wellness product in the last 20 years—Derma Fusion Technology 2.0 (DFT)—DFT ULTRA 2.0 is the next breakthrough in Le-Vel's prized Derma Fusion Technology delivery system and a huge step forward from DFT ULTRA 1.0. With 2.0 permeation technology, Forslean concentration over two times greater than ULTRA 1.0, and the highest concentration of Garcinia extract and Forslean of ANY DFT Formula, DFT ULTRA 2.0 truly is a Premium Product on a Premium Level. Consider adding DFT ULTRA 2.0 to your THRIVE 8-Week Experience. For Ultra Weight Management results, add DFT ULTRA 2.0 + THRIVE Balance to your THRIVE 8-Week Experience.